doi:10.4236/jbise.2010.37094 Published Online July 2010 (http://www.SciRP.org/journal/jbise/). Department of Community Health and Psychiatry Faculty of Medical Science University of the West Indies, Mona. 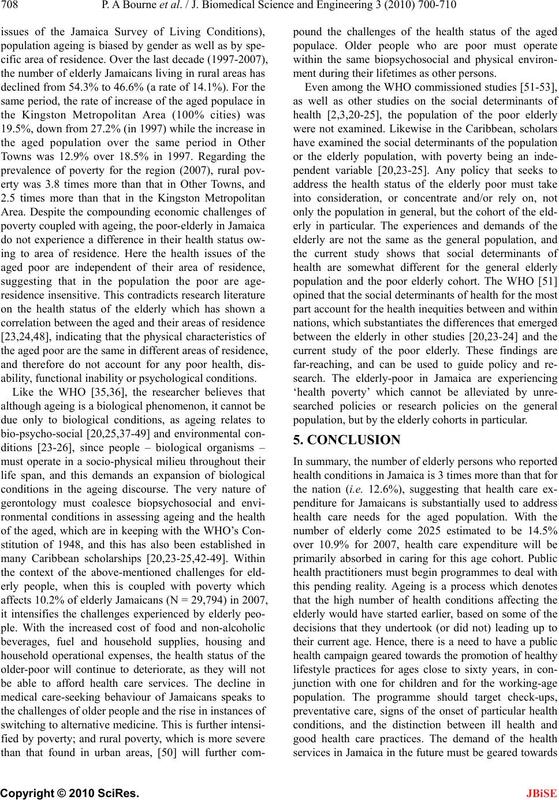 Received 15 March 2010; revised 6 April 2010; accepted 8 April 2010.
health status of older people in the two poor quintiles. istered questionnaire was used to collect the data. ondary level education (OR=1.82; 95% CI: 1.35-2.45). same, even among the same age cohort. 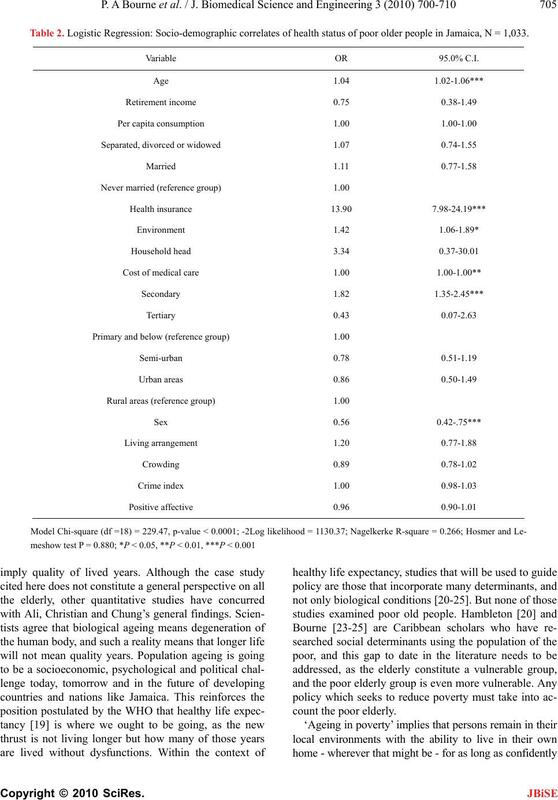 a sample of 1,149 elderly poor Jamaicans. lated with a higher standard of living and life expectancy. lace, is higher in countries with high GDP per capita. ity food, safer sanitation and education. their basic needs and provide vital nutrients for survival. status of older people in the two poor quintiles. pendent geographic unit that shares a common boundary. represent the population of the country. goods, and 11) demographic questions. in a room with a particular household. from 15 to 99 years. his/her 60th birthday or beyond. (quintile 1) and the wealthiest being in quintile 5. Table 1. Socio-demographic characteristics of sample. ported that they could not afford it. US $7.85 (US $1.00 = Ja. $50.97). are 1.5 oldest-old and 1.3 old-old poor. clined by 17 times for those who had dysfunctions. erage the elderly are living 15-20 years after retirement. plies a demand for certain services such as geriatric care. Table 2. 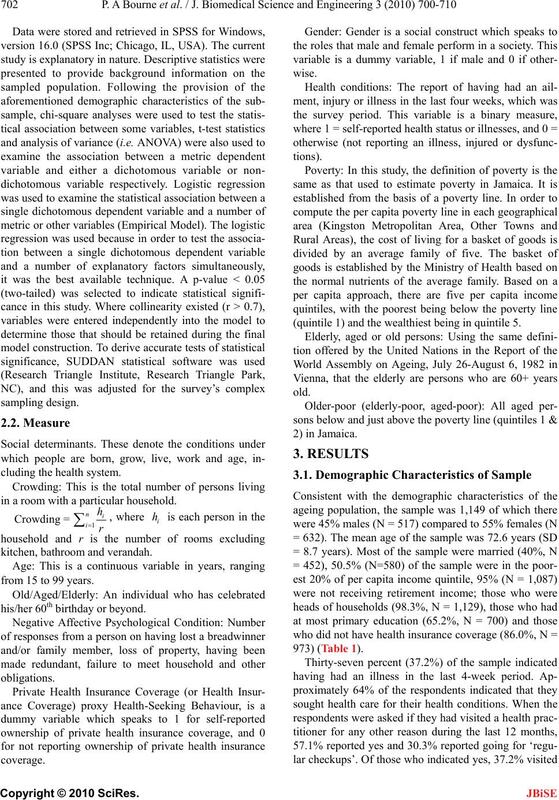 Logistic Regression: Socio-demographic correlates of health status of poor older people in Jamaica, N = 1,033. Va ri a bl e OR 95.0% C.I. and functional status that facilitate ageing in place. 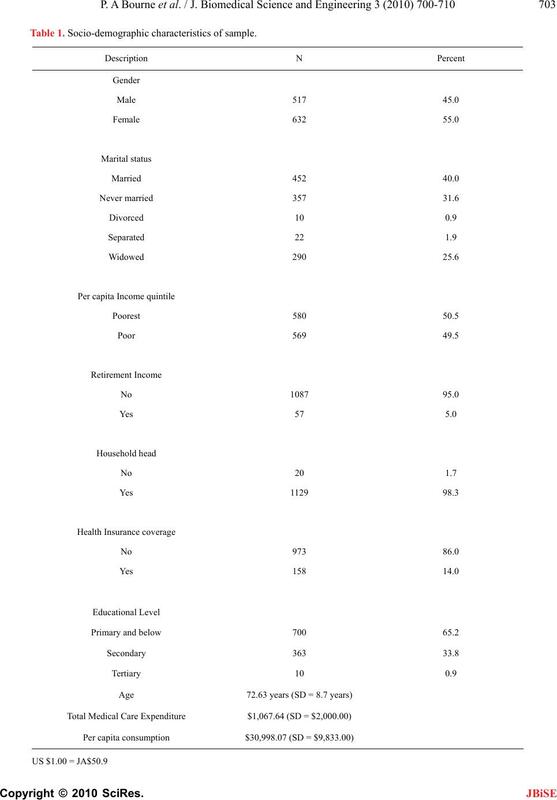 least poor, with 20.6% falling in the poorest quintile. cipitous increase in inflation in 2007 over 2006 (194%). 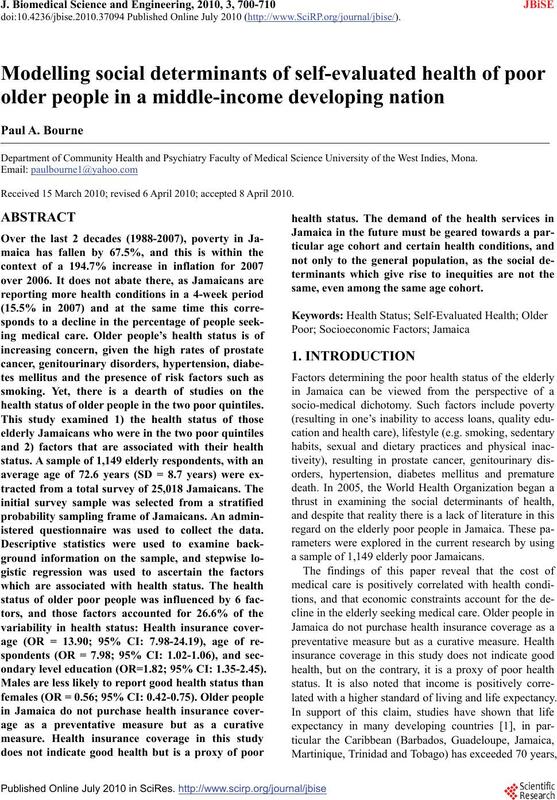 Jamaicans not seeking medical care for illness/injury. lower income, illnesses and severity of health conditions. ing their personal physicians or health care facilities. shows that women seek more medical care than men. tional 2 and one-quarter years more to their life span. must be examined in this discourse. class had the least self-reported health status . reduced skin elasticity and a decline in aerobic capacity. sion, diabetes, and heart diseases than younger ages. young-old, old-old and oldest old. ability, functional inability or psychological conditions. ment during their lifetimes as other persons. population, but by the elderly cohorts in particular. even among the same age cohort. The author reports no conflict of interest for this study. tistical Institute of Jamaica, but to the researcher. the researcher is indebted and greater appreciate this gesture. 21st century. A vision for all. WHO, Geneva. Views of an epidemiologist. Does money really matter? I., Oxford Univeristy Press, New York. success and failure. Economic Journal, 108(446), 1-25. How much can be gleamed from cross-sectional data? 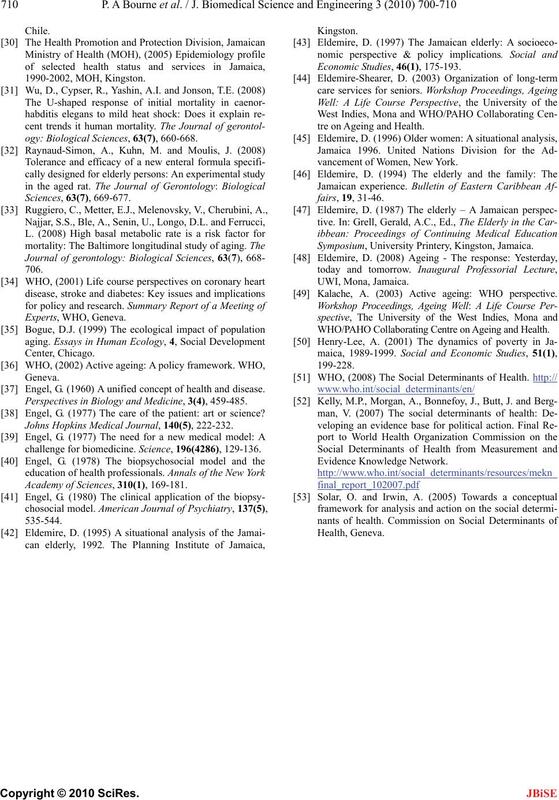 Social Policy and Administration Quoted in Benzeval, M.
and Judge, K., Income and health: The time dimension. Social Science and Medicine, 52(4), 1371-1390. July-August 2006 leadership and governance survey. cepts. Oxford University Press, Oxford. meny, P. and McNicol, G., Eds., Macmillan, New York. rankings: Japan number one in new ‘healthy life’ system. WHO, Washington D.C. & Geneva. 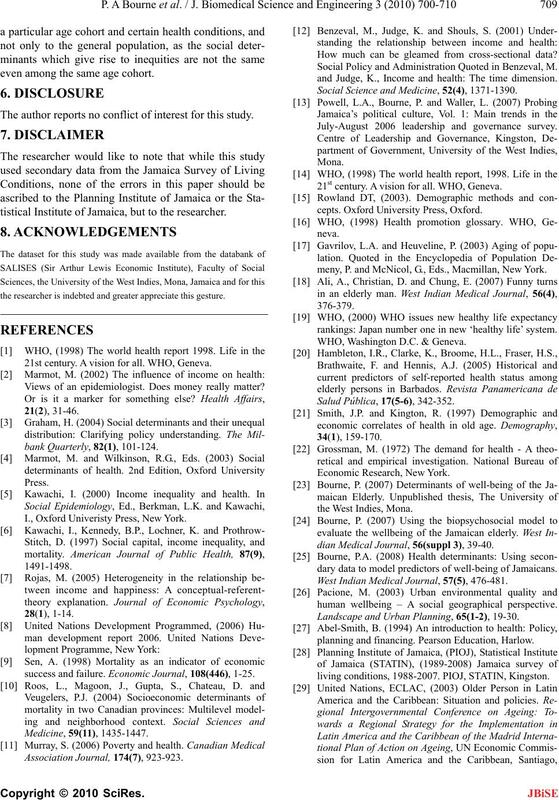 dian Medical Journal, 56(suppl 3), 39-40.
dary data to model predictors of well-being of Jamaicans. 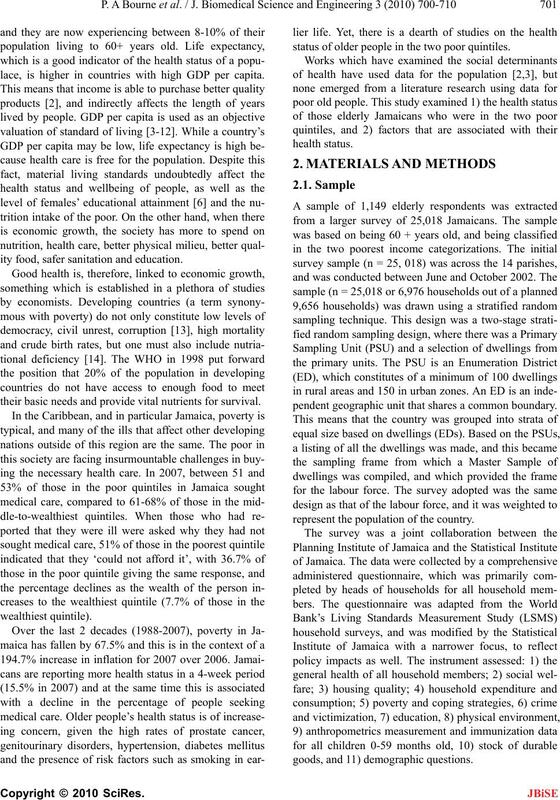 West Indian Medical Journal, 57(5), 476-481.
human wellbeing – A social geographical perspective. Landscape and Urban Planning, 65(1-2), 19-30.
planning and financing. Pearson Education, Harlow. living conditions, 1988-2007. PIOJ, STATIN, Kingston. ogy: Biological Sciences, 63(7), 660-668. Engel, G. (1960) A unified concept of health and disease. Perspectives in Biology and Medicine, 3(4), 459-485. Engel, G. (1977) The care of the patient: art or science? Johns Hopkins Medical Journal, 140(5), 222-232.
challenge for biomedicine. Science, 196(4286), 129-136. 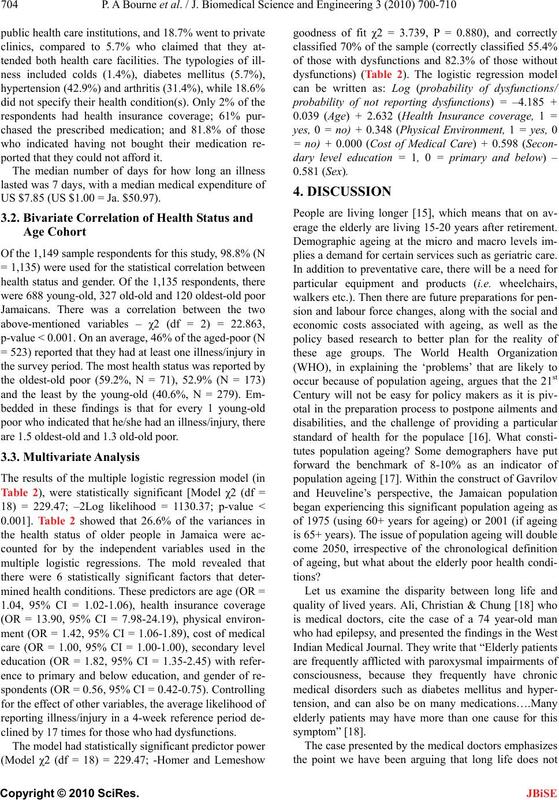 Academy of Sciences, 310(1), 169-181.
tre on Ageing and Health. vancement of Women, New York. Symposium, University Printery, Kingston, Jamaica. Kalache, A. 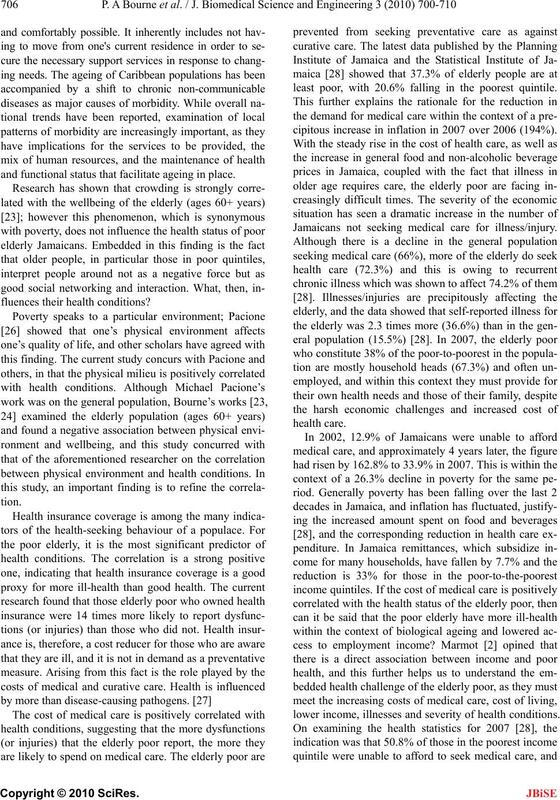 (2003) Active ageing: WHO perspective. 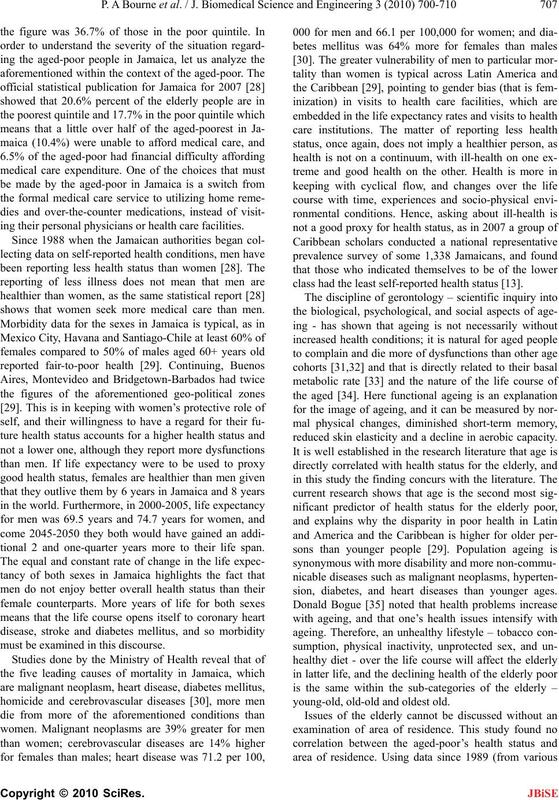 WHO/PAHO Collaborating Centre on Ageing and Health.